You are here: Home / A-Blog / Trump signs massive spending bill, backing away from veto threat. President Trump on Friday signed a $1.3 trillion omnibus spending bill, averting a government shutdown just hours after he created drama and uncertainty by threatening a veto. Trump blasted the measure as “ridiculous,” in large part because it contained only a fraction of the money he asked for a wall along the Mexican border and did not include a fix for young immigrants covered by the Deferred Action for Childhood Arrivals (DACA) program he spiked last year. “There are a lot of things that I’m unhappy about in this bill. There are a lot of things that we shouldn’t have had in this bill. But we were, in a sense, forced to if we want to build our military,” the president said during an impromptu event at the White House. Trump, who has frequently been frustrated in working with Congress on spending bills and has surprised Democrats and Republicans alike with some of his tactics, vowed that he would not sign a similar bill going forward. 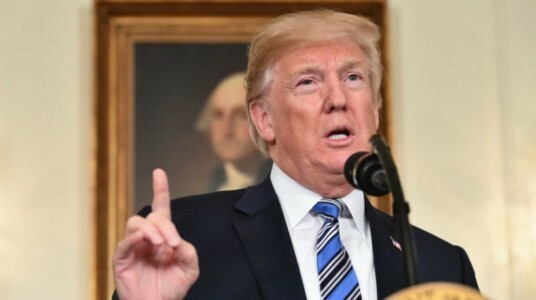 The president called on Congress to give him the power to make line-item vetoes on all government spending bills and called on the Senate to end its filibuster rule to make it easier to implement the Republican agenda. The bill signing came just hours after Trump stunned many in Washington by threatening to veto the measure. If Trump had vetoed the bill, it would almost certainly have led to a government shutdown at midnight. The comments undercut guarantees from his own staff, who said he would sign it all along. “Let’s cut right to the chase. Is the president going to sign the bill? The answer is yes,” White House budget director Mick Mulvaney said Thursday. Following the tweet, a White House official said Trump would sign the bill and told The Hill that the president wanted to add some “drama”” to the day. Defense Secretary James Mattis, who was at Trump’s side for the announcement, reportedly met with the president on Friday to persuade him to sign the bill because of the boost in funding to the Pentagon. In threatening a veto, the president had appeared to have been swayed by conservatives who ripped the legislation for adding to the debt. They have also criticized a process that saw lawmakers approve the bill within 24 hours of its release — a timeline that left little time to read the bill. Sen. Bob Corker (R-Tenn.) also urged the president to nix the omnibus. But Trump ultimately decided to prevent another government shutdown, a scenario members of both parties also wanted to avoid. The Senate sent the bill to Trump’s desk early Friday morning on a bipartisan, 65-32 vote hours after the House approved the measure. The bill would fund the government through the end of September. The president, however, struggled to overcome his frustration that the bill contained just $1.6 billion for his long-promised border wall. Trump had asked for $25 billion over 10 years to fund the structure as part of a broader immigration deal that would have also addressed DACA recipients. The president floated a plan that would offer them a pathway to citizenship in exchange for the border wall money and changes to the legal immigration system, but Congress rejected it. “I do want the Hispanic community to know and DACA recipients to know that Republicans are much more on your side than the Democrats, who are using you for their own purposes,” Trump said. The president announced last fall he was cancelling the Obama-era DACA program, which offers deportation reprieves and work permits for roughly 800,000 young immigrants brought to the U.S. illegally as children. A federal judge blocked Trump’s order, meaning the program still remains in place.